Must I buy expensive new SWI software? What's wrong with using T2*-GRE sequences instead? GRE vs SWI which is better? T2*-weighted gradient-echo (GRE) sequences have long been used to detect blood products and calcifications due to their sensitivity to local susceptibility effects. These sequences are characteristically operated in 2D multi-slice mode using relatively long TR's and low flip angles (both minimizing T1 effects) and relatively long TE's (to accentuate T2* dependence). Typical parameters for T2*-GRE brain imaging at 1.5T might be TR = 700, TE = 25, and α = 20°. Modern susceptibility-weighted imaging (SWI) methods are likewise based on GRE sequences, but incorporate numerous enhancements to heighten their sensitivity as well as phase mapping to distinguish paramagnetic (hemorrhage/iron) from diamagnetic (calcification) substances. Additionally, all experienced investigators have encountered numerous clinical cases where the number of lesions on SWI far exceed those on T2*-GRE. 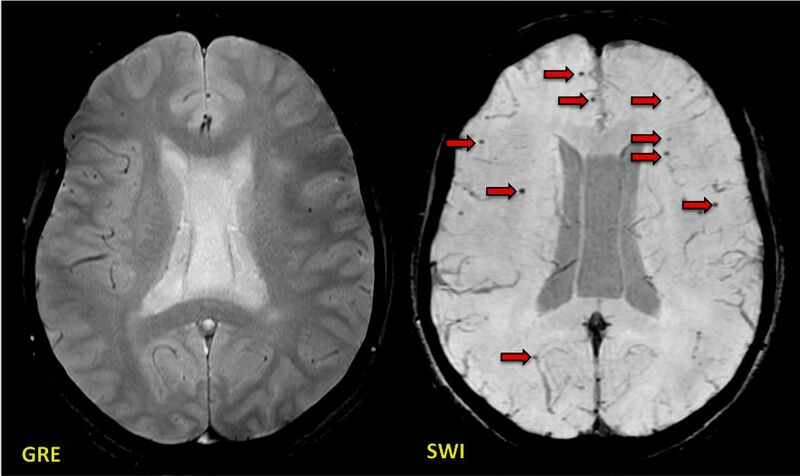 The most dramatic examples showing the superiority of SWI over GRE include traumatic brain injury and microvascular angiopathy. To be fair, SWI sequences do take more time to acquire than simple T2*-GRE's, and sometimes their image quality is not as good due to motion artifacts. Potentially more false positive and equivocal lesions may also occur with SWI. Nevertheless, I believe that you are indeed going to have to purchase an SWI sequence if you wish to continue to perform state-of-the-art imaging for your patients in the future. Even though a TE value of 25 ms does not seem "long" by spin-echo imaging standards, it is relatively long compared to the T2* values of tissues, which are much shorter than tissue T2's. Increasing TE much beyond 30 ms also impairs signal-to-noise of the sequence and results in too much susceptibility artifact near the skull base. Tong KA, Ashwal S, Obenaus A, et al. Susceptibility-weighted MR imaging" a review of clinical applications in children. AJNR Am J Neuroradiol 2008; 29:9-17. (Good review showing superiority of SWI over GRE for detecting small hemorrhagic lesions).